FGP Ltd. is in portfolio of Subramanian P. He is one of the top investors in India. It was a curious case for me. The website of Company provides not details whatsoever about business of it. The only thing interestingly Company website does is to list all Annual Reports and financial details about it . This is the only thing Company has on its website. It does have a contact page listing details of Company office. The Company office is situated in Mumbai. I was unable to find much authentic details about it. At best I can make out that it is related to Glass sector. Now lets look at performance of this company over the years.As per Dow theory of technical analysis price performance over a period of time reflects Company state. Though I am not too convinced that it would have performed decently over the years for investors. 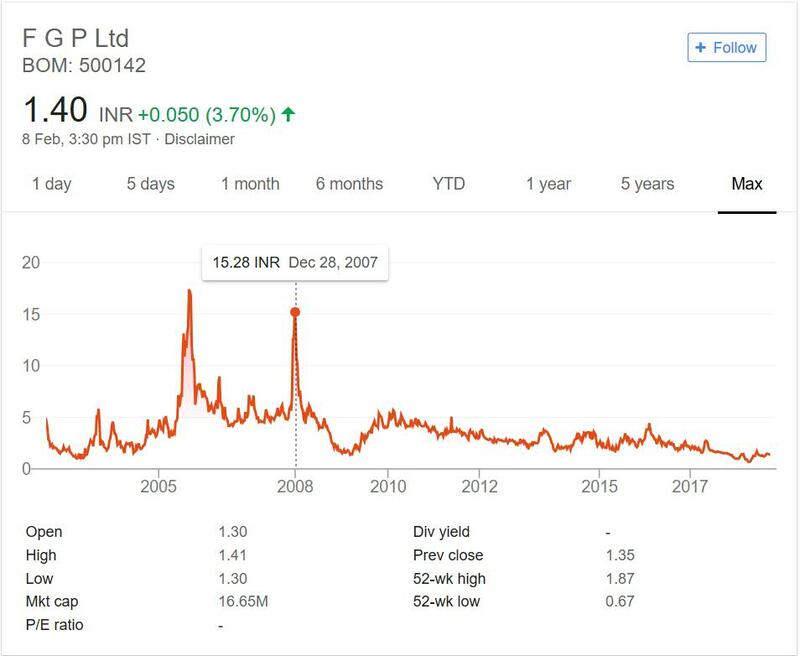 In year 2002 the Company was trading near 5 INR mark. In year 2018 it is trading close to 1 INR. So Company has under performed in these years. It has destructed money invested in it. There were two towers in these 16 years which look more like traps than actual performance based towers. The sudden rise and fall in prices does not comfort investors. FGP limited has nothing going for it. It does not provide enough information about itself on the website. It has not performed well over the years. Note after year 2010 it is constantly declining in prices. You may get compelled to buy cheap thinking prices may not get below 1 INR. But there are companies which are trading at 10 paise and 5 paise. So do not buy a Company thinking prices can not slip below this price. Performance can only drive price for long term and speculation can drive for short term. If both does not work for any Company then prices will go down. The logic of Company trading below 1 INR or below 10 INR does not work if Company is not performing or does not look sound for future. .In case you are interested then you can track the company by adding it to your stock watch list. That way you can keep close eye on the Company.